"I stand before you wanting to continue the exploration, an exploration of my own soul and my relationship with Jesus Christ," Burns said. He said he is looking forward to the "time of formation" to learn his new responsibilities and duties that it takes to be a bishop. At one point in the ceremony, Burns mistakenly said Pittsburgh instead of Juneau as he spoke about the new diocese he has been assigned, which drew some light chatter from the audience. "I'm looking forward to gathering around the tables of this diocese - the kitchen tables, the dining room tables ... in all the small villages. 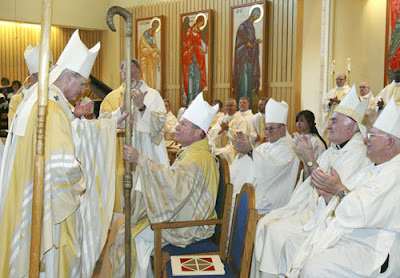 I look forward to coming and gaining a sense of what it is to be a bishop," he said. 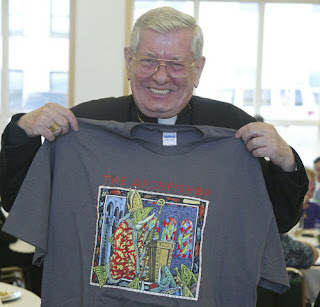 Held in a parish church due to the small size of Nativity Cathedral, the installation marked the first trip to Alaska by the papal nuncio to the States, Archbishop Pietro Sambi, who was given a special gift by the natives... and, clearly, didn't mind showing it off. On a related note, while the Stateside bench hasn't seen a Holy Week appointment in a considerable number of years, buzzmill's humming with word that the longstanding tradition might not survive this Holy Week intact.